Katie Salidas: Would you like to participate in Vampire Awareness Month - October? Would you like to participate in Vampire Awareness Month - October? I'm looking for guest post about vampires to feature on this blog during the month of October. Anyone who's a fan of those fanged creatures of the night can contribute. 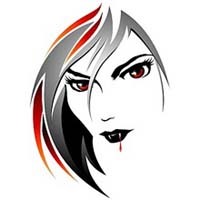 Send me an email at ksalidas@cox.net with VAMPIRE AWARENESS in the subject line if you would like to contribute a guest post to this month long blog event. For authors: At the end of each post you can do some promo for your books, but I'd rather not have the entire post be advertisement. Keep it simple. What I want is more on the subject of vampires. Why did you chose to write about them? What makes them so interesting? What was the first book that sparked your interest in them, etc... That kind of thing. At the end of the post authors can pimp their work, but I don't want it to be 100% advertisement.Readers ignore things like that. Sadly, the blogosphere is just flooded with reviews and promotion that it's becoming a bit of white noise to consumers. Readers do still seem to respond to actual content though. This could provide a nice (free) way for authors of paranormal fiction to gain some added exposure. I will have some spots open on the weekends during the month of October for Vampire book features. This is a first come first serve basis. Please contact me at Ksalidas@cox.net first to see if space is available. For advertisers: Have a vampire related product you'd like to have featured in the sidebar of the blog during Vampire Awareness Month? Contact me at ksalidas@cox.net for information and pricing. Great Lorelei. Be sure to email me what you want to post. I'll need it all before October begins. Oh, I am so in. I loves me the vamps! Got your email Erin! Glad to have you participating. Can't wait to see what you come up with!! It will most likely be about vampires, of course. But I'm thinking on stuff for all of October. I'll get back to you in an email. I sent you an email with all the info. I sent two emails because I think I forgot the attachment in the first one. let me know if you didnt get them.